Apart from the Eagles condition, the big assumption above is that the Redskins are done but who knows if they really are. Even if they don't have Nick Foles. Of course they could also get to 6-6 and easily lose three of the last four games (at Cowboys, at Rams, Texans, at Redskins). And yes, Groh has failed, but that doesn't mean hiring someone of similiar pedigree (longtime offensive assistant) or an experienced coordinator from outside would have worked out better. That all goes back on the HC though, since the theory was, it's his offense and he just needs people to help run the show, not an OC calling all the shots. Let's play the Win/Loss game. That would get them to 7-9. If they can win at Dallas and get the season split we're at 8-8. Groh states that it's difficult to incorporate Tate into the Eagles' offense. Thus far his presence hasn't been noticeable. It's obviously also changing Agholor's role. This comment really underlines what a futile, useless, desperate this trade was. We needed that #3 this off-season -- lots of holes to be filled. And the 'showing up your GM award' to Groh is: probably a ticket out of town or if he stays in Philly a demotion and replacement by an OC from the outside. As an OC he has been a fine wide receivers coach. Can't blame the offensive woes all on him -- some on the players, others on Doug, but Reich and DeFilippo's offenses doing just fine and better than last season. The Eagles took a page out of the Phillies playbook and rewarded just about everyone associated with the Super Bowl team -- not an especially good idea. Zach Berman in PhillyNews column from yesterday asks a very legit question: why didn't Pederson put Foles in at QB when the game was obviously lost in the 4th Qtr? A quarter of live action would help keep Foles relatively sharp and would avoid a high injury-risk situation for Wentz. Was this punishment for throwing a lousy game? Is it shifting the blame for the reduced effectiveness of Tate and other WR since Tate was added to the team? Pederson says he didn't even consider removing Wentz. Why would he not even consider the obvious move? He says players need to work through problems like Wentz was having. It seems equally likely that whatever new bad quirk he picked up for this game risks getting ingrained by continuing to play in this disaster of a game. Fix what is wrong in practice. Likely what was wrong isn't Wentz. Groh says he can't figure out how to use Tate and Agholor in his new set of WR. Were the WRs where they were supposed to be on their routes or was this the source of Wentz's problems, in addition to a poor running game and OL problems? Both the Eagles O and D units are absolute messes at the moment. Jernigan is back, has been added to the 53 (in place of McGill) and will play this weekend. Kept the season alive with a must-win, come-from-behind victory over the Giants. They still did not look very good, but they survived. Wentz was good and the running game actually gained some yards. With the win, the Eagles actually control their own destiny to win the division. They need to fix their problem with slow first quarter (really almost first half today) starts. Since they start the game with a list of scripted plays, the problem is either the plays included in the script or the opposition has a copy of that script. Since it's hard to believe that someone could secretly leak our starting script to all of our opponents, it must be the quality/predictability of the plays in that script which is at fault. When this happens week after week, it is a very serious problem which is on the coaching staff and which that staff needs to fix. We won today, but against a mediocre team, rather than a poor team, the game was over at halftime. I think the Eagles should just eliminate the start-of-game script and handle those plays on-the-fly as they call the offense for the rest of the game. Using a fixed script has obviously not worked. It is insane to repeat the same mistake over and over and over. It is easy for the coaches to say that the problem is execution. Either call plays which the talent on your team is capable, with current injuries, of executing or teach them to reliably execute them properly. Since I'm sure they've tried and tried to teach proper execution, the obvious conclusion is that these are the wrong calls given the current state of our offense. Also, Pederson has go to commit to the run. When it's working, keep mixing it in there. The way the Giants came out in the second half it almost seemed like tanking. "We listen to our guys." So, if I read this correctly, the run was working, everyone saw it was working, and the o-line asked him to keep running. My question is this - if they hadn't asked him to keep running, would he have moved away from the run even though he saw it was working? An article in The Athletic, hopefully accessible despite firewall, on how the Golden Tate trade has hurt the offense. If you can't get it, the gist is that 1) Tate has a low catch rate and a low yards per catch and 2) incorporating Tate into the game plan has cost significant chances for our best WR (Jefferies) as well as the less-good Agholor. 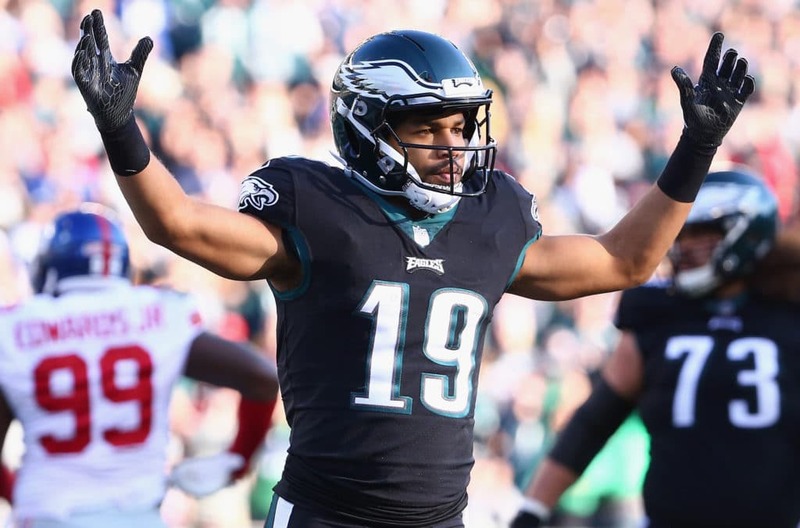 Sheil Kapedia speculates that Agholor would contribute more if he were getting Tate's chances. Tate's YAC is very low. Carson Wentz is averaging just 4.6 YPA when targeting Golden Tate. What's been the issue? Who is Tate stealing targets from? And can the Eagles find a solution? Sheil Kapadia dives into the numbers. Well, items 1 and 2 worked out in our favor. But, the Saints aren't cooperating, about to lose to Dallas. bit of a surprise but maybe the Eagles will win one we don't think they can too. Dallas has really improved. I don't think we can beat them. This is one of those instances where we aren't mathematically eliminated, but the season is over. I tend to agree with this. We're still in it, but Dallas has definitely improved on both sides of the ball. And, somehow, they picked up a WR near the deadline and figured out how to incorporate him in the offense. GO figure. Also, that Vander Esch kid at LB looks like a stud. The Eagles cannot lose to Dallas, that would practically eliminate them from the playoffs. Dallas has the easier schedule. The Eagles have to win the rest of their division games to have a shot, and best one of the Rams or Texans games and they are in.